The Big Game on our big screens! There’s no better place to catch Super Bowl action than at the best and oldest sports bar in Dallas. 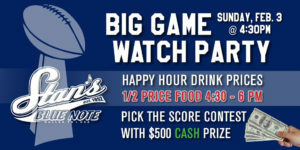 On Sunday, February 3rd, we’ll have the Patriots vs Rams on our big screens, a free Pick the Score Contest with a $500 cash prize, and half price food from 4:30 to 6 p.m. Arrive early for Happy Hour specials from 4:30 p.m. to the end of the game. Kickoff is at 5:30. Stan’s Blue Note is located at 2908 Greenville Ave, Dallas, TX 75206. Here you’ll find more than 30 big screen TVs tuned in to non-stop sports action, a pool table, shuffleboard, dartboards, karaoke, trivia contests, music, and two outdoor patios. We will have the GAME on the big screen!